Your garden is still a garden even in the cool months. Plants and any other semblances of life seem to go dormant during these cooler months, but it’s just enough time for our colorful friends to get their beauty rest. For a fresh burst of color in the early parts of Spring, it’s a safe bet to go ahead and plant those bulbs just after Halloween. The critters have gone to their winter hiding spaces and the soil/mulch combination forms the perfect ‘hibernation’ chamber for your bulbs. Here’s how to get a colorful bouquet-style garden at the first signs of Spring. Typically perennials, bulb plants are plants that have underground fleshy storage structures. These plants store their complete life cycle in a bulb-like pod under the soil. These bulbs store nutrients necessary for the plant’s survival. The bulb usually signifies that the plants are alive, but ‘asleep’ in a dormant state. 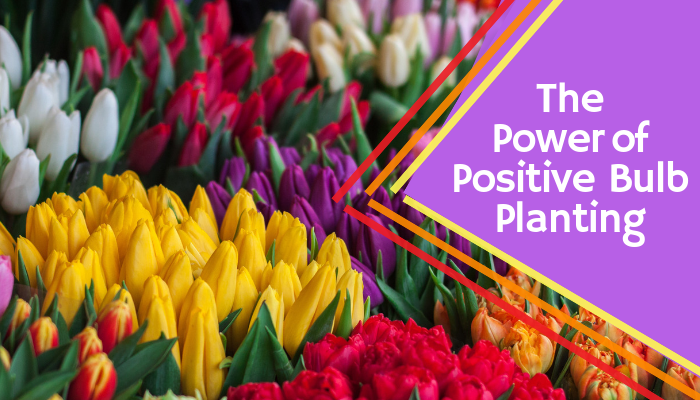 These plants are often purchased as bulbs, planted in the ground and they grow and flower later on into beautifully colorful flowering plants. Bulb planting is super easy and you reap the benefits of your work later on. It’s fun to see these plants sprouting out to help bring in a new season. It creates the perfect garden with very minimal work ahead of time. Plus, if they’re perennials, they come back year round. There are hardly any drawbacks to this type of gardening. The possibilities are endless when it comes to varieties of bulbing plants. However, because of our crisp winters and cooler spring seasons, there are some varieties that are a perfect fit. In the Andover area, we recommend planting Most Narcissus (Daffodils) such as Dutchmaster, Ice Follies, and Cheerfulness. We also recommend any variety of the Darwin Hybrid Tulips such as Grand Mixture, Pink Impression, Red Oxford, and Golden Oxford. These bulbs keep perfectly in our moderate to cold winters and mild summers. Plus, you won’t be disappointed at the pop of vibrant color you’ll get from these audacious blooms. Planting bulbs is super easy. Plan to have your bulbs in the ground about six weeks before the ground freezes so that the roots will have enough time to spread. Check your planting instructions for proper depth, but generally we recommend you dig deep enough that the top of the bulb is six inches underground. Go ahead and dig a wide square and plant your bulbs all at once neatly aligned according to your preferences. As a general rule of ‘green’ thumb, make sure the bulbs aren’t touching each other so your plants will have enough space to spread their liveliness. Cover the bulbs with the soil you’ve just dug up, pack it in nicely then top with a layer of mulch for added protection and support. Water the area immediately after planting to help jumpstart the rooting process. Voila! You’ll start to see some flowers at the first signs of Spring. Don’t let the colder months get in the way of gardening. In fact, this can be the best time to do some gardening. This is a time when cool, crisp Fall air hits your face and you can almost hear Winter on its way in the wind. There’s no time like it. Planting bulbs during this time of year is so easy, you can do it in your own garden and it other areas of the community as well. That way, when Spring hits, other people will also enjoy the colorful ‘fruits’ of your work. That’s the power of positive bulb planting! No Replies to "The Power of Positive Bulb Planting"